As the kids get older I see how birthday parties, practices, recitals and play dates can quickly over take the weekend. No matter how busy the days feel we try really hard to make Sunday night supper a real family experience cooking together as often as possible. This also means that on Sunday mornings we go to the farmers market together and decide what we're going to cook that night. Without fail someone asks to make potato chips and more often then not it's me or my hubby. Just this past weekend we made a mix of purple and russet potatoes that turned out crispy and the perfect accompaniment to kabobs. For this rewind Wednesday I'm sharing one of our families all time favorite recipes! 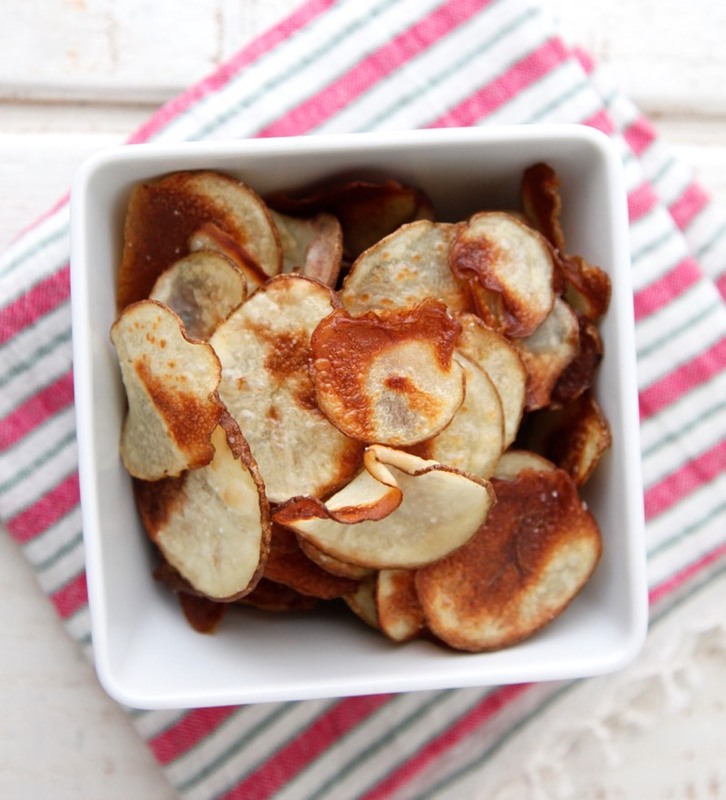 OK, seriously, who doesn't like a potato chip? Left to my own devices I could devour an entire bagful in one sitting. However, your average store-bought bag of chips is laden with saturated fat and calories that I don't want or need, and while I don't want to deprive Kenya of the great treat of chips, I certainly want to keep him away from bad fats and mega-doses of sodium. Sure, most chip makers offer "healthy" versions, but they're still not great for you and why spend the extra money when you can make even better ones on your own for a huge fraction of the price? I've been making these "potato chips" for me and my husband for years and now Kenya gets to be part of the fun. You can make them with almost any kind of potato (the sweet potato version is AMAZING and loaded with vitamins and minerals). They only take minutes to prepare and are a fantastic snack for kids' lunch boxes too. 2. Slice the potato into “chips” using a knife or a mandolin, about 1/8 inch thick. 3. 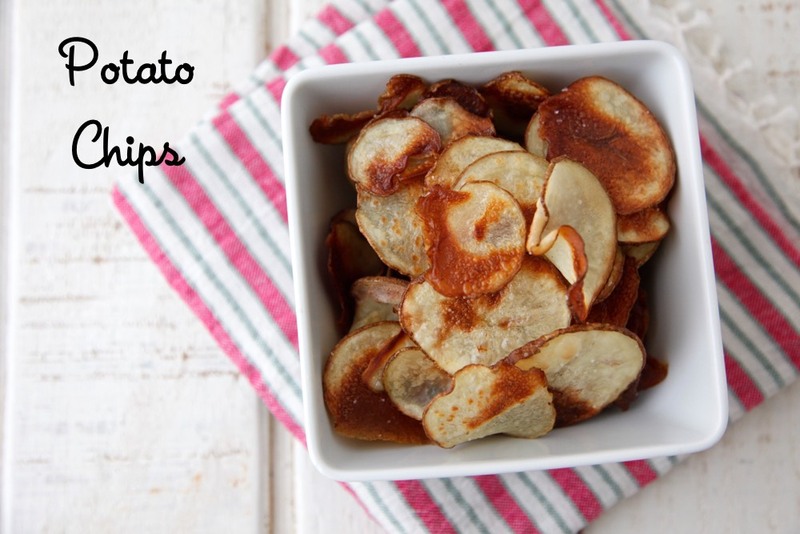 Combine the potatoes, oil and salt in a bowl or resealable bag and coat the potato chips. 4. 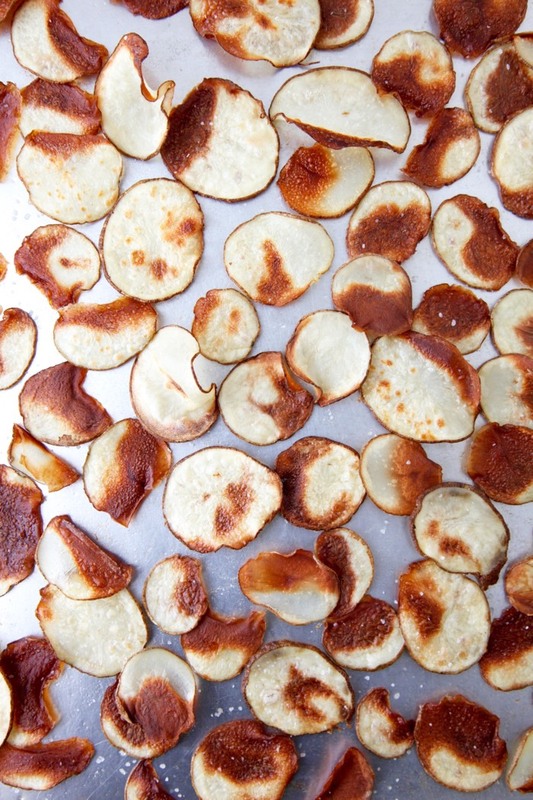 Grease 2 cookie sheets with a thin coating of vegetable oil and make one layer of potato chips on each cookie sheet. 5. Bake for 15-20 minutes or until chips start to turn golden. Turn the chips to the other side and continue to cook 15 more minutes (some of the chips may turn golden before others, so make sure to keep an eye on them and remove them when crisp). what temp do I bake the ships at? These sound great and I can't wait to try them. I am always trying to come up with healthy snacks for my son to take to preschool(that won't just come right back home when he sees what the other kids get!!). Just one idea or thought.... they look a bit thicker than traditional chips....I wonder if they would lend themselves to a cracker substitute for parties??? At what temp do we cook the potatoes? What is the oven temp supposed to be to cook the potatoes? Sounds great! What oven temp? Looks good! What temperature for the oven? I don't see it, I may just be blind today though. That is so funny because I just got one of those potato shooter things yesterday and just finished making potato chips fried in oil and I was thinking....there has to be a healthier way to do this. I took a break and logged onto your site and lo and behold.....LOL! Thanks for the tip! Can't wait to try these! I love that they are baked! I love sweet potato chips and we sometimes do beet chips. I never turn them over...brilliant..thanks for the tip! YUM!!!!!!!!! I so need a mandoline. Oh wait, I have one in my cabinet...hmmm, I wonder if I have potatoes. Can't wait to try. Have tried to make chips unsuccessfully before. Fingers crossed! Sweet Potato Chip Fail:(. They didn't crisp up! Is it possible we used too much oil? I'm so trying these!! Would it be the same for other root veggies (ie parsnips, carrots, beets, turnips, etc)? I've tried and failed numerous times to do parsnip chips. They taste great but they always end up soggy little heaps! I am working on a beet recipe (working to get them perfectly crispy without burning!) I'll have to try those other veggies, too! I can hardly wait to try these; loving that they are not sitting in a vat of oil. Much healthier the way you have it written. Can you bake these without using oil? No because they'll just dry out! Made those today. Yumm! Thank you! Would canola or olive oil work? This looks great should i line the baking sheet with anything or just place it directly on the baking sheet? Placing food directly on anything makes me nervous. I place them directly on the baking sheet! The oil will prevent them from sticking. You can use foil or a Silpat, but they come out a little different in texture. I baked these for 15 mins and they were ALL burnt - I am talking smoking and black.